Below is a detailed article that speaks about the different paintings by the famous British painter – Helen Allingham. She was an illustrator of the Victorian era. She was the maternal granddaughter Sarah Smith Herford, a renowned artist of her time. It is possible that she drew her early age art influence from her grandmother. She went to Birmingham School of Design and then joined the Royal Academy Female School of Art. Initially, she sketched black and white figures and sold them to make a living. Her work began to appear in children’s books. From there onwards, she gained popularity and grew in watercolors. She is known for her detailing in watercolors and multiple illustrations. It is a watercolor painting, displaying high serenity and a windy yet calm atmosphere. The amount of light is perfect for a sundown moment. 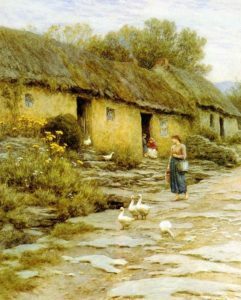 The painting is of a young woman (possibly herself) exploring the streets of Ireland and admiring the simplicity in the cottages. The painting shows beauty in simplicity and promotes a lifestyle adopted by the highlands of the Irish territories. The ducks in the painting add to the peaceful element that the painting has. The growing ivy on the roof of the cottages is displayed with perfect brushstrokes and a mix of a single green color combination. This is an excellent watercolor work by Helen Allingham. As shown in her paintings, she was excellent at capturing peaceful, surreal moments in her paintings. This is a painting of the green entrance of the cottage in Ireland. These paintings are inspirational to cartoon animators in the mid 20th century when stories of Snow White and Cinderella came out. The peaceful and quiet atmosphere literally makes one gaze at the artwork to attain that peace. Many critics appreciated her work and a few found it generic at the time. However, the painting has excellent watercolor brush strokes that the painting looks almost photographic. Helen Allingham painted an excellent life portrait of her husband – William Allingham. William was an Irish poet and editor of the Victorian era. In the portrait, William is shown reading or studying a book which rightfully matches his character. 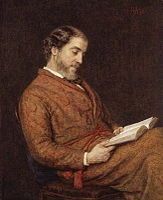 The portrait is personal, shows William in a comfortable night suit, reading at bedtime which must have been the most relaxing part of the day for William. The lighting used to show the set up of the painting is well done. This painting was published in 1876. 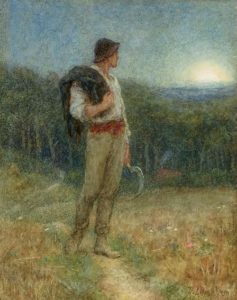 This watercolor painting by Helen Allingham shows a young hard working man, a farmer gazing at the moon as it makes its way out of the bushes into the sky. The painting has a light tone. Just like all other paintings, this painting too isn’t loud in any way. It is a calm and surreal work. The man in the painting stands for hard work and perseverance that he has done throughout the day. The colors in the painting are used perfectly in order to set an evening tone to it. A mix of post-sundown and dark sky have been used tremendously well in this painting. 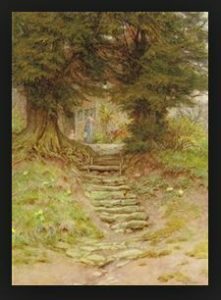 The painting is another watercolor work by Helen Allingham in 1879 and was applauded for its intense color scheme portraying a dense forest. It shows a lady trying to help two children that seem to have lost their way into the forest. The painting is an illustration of a scene of a novel.